In 1972 music teacher Joyce Garrett took direction of the Eastern High School Choir and was determined that her students would achieve a professional level of excellence. In 1987, this excellence was realized when the Choir won the silver trophy at the 1988 International Youth and Music Festival in Vienna, Austria – an award never bestowed upon an inner city choir. Upon their return, graduating choir members were offered full tuition scholarships to the University of the District of Columbia but only three of Garrett’s twenty seniors intended to go to college. In response, Garrett expanded the Choir’s rehearsal schedule into a four day a week after school program that used music as a vehicle to impart core values, promote higher education, and instill the belief that excellence could be achieved despite disadvantages – hence the Choir’s motto Excellence without Excuses. In 1995 a nonprofit organization called the Eastern Choral Society was created to provide managerial and operational support to the Choir and its activities. In May 2005, the Eastern Choral Society decided to broaden its mission to fulfill the educational needs of DC-area youth through the creation of the Washington Youth Choir. 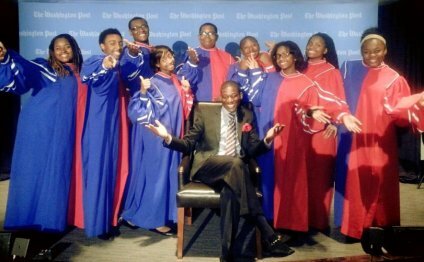 Building on the success of the Eastern High School Choir model, the Washington Youth Choir officially launched on January 9, 2006 in residence at Calvary Baptist Church in Northwest DC. Enhance the educational experience of DC-area youth with the rigorous study and performance of music and facilitate their transition out of high school. Our youth are inspired to lead happy, productive, and meaningful lives. We believe in the power of music to transform lives. Through music-making, we broaden our perspective, improve our quality of life and promote lifelong learning and growth. As teachers, we are committed to improving the education of our students by exposing them to new ideas, places, and people and imparting the value of hard work, perseverance, discipline, and teamwork into our daily interactions with them. As ambassadors, we believe our goals are best served by intentional efforts to build relationships on many fronts. As advocates, we serve as a powerful voice for the well-being of our students. Our success depends on our integrity, knowledge, creativity, hard work and cooperation of everyone involved in our organization. To this end, we create an environment that is engaging, nurturing, and youth-focused. Washington Youth Choir " Eyes On the Prize"